I'm so happy that I seem to be easing back into eating "real" food! We were gone for the long weekend to the mountains of Western NC, visiting Asheville and nearby Hot Springs and the waterfalls of Transylvania County. On Saturday, friends of ours made a simple meal that we could enjoy - I had a very welcome and tasty baked potato and a little bit of tempeh. On Sunday, we were planning to try good vegan food in Asheville, but the restaurant that we thought might stay open late didn't, and we, unbelievably, were finally stuck with late night pizza; though we love cheeseless vegan pizza (remember to ask for crust for egg/whey ingredients), the one we had was quite uninspired. But yesterday we got to eat at our favorite Asheville restaurant, the all-vegetarian Laughing Seed Café. My wife and I shared salad, a tasty soup, and, when we were saddened to hear that their Rosemary-Walnut Crusted Seitan was sold-out, had their Wild Mushroom Risotto Cakes. Today, I had limited time to cook; we received our beautiful new purple tandem bicycle from Bike Friday, and worked on putting it together (what difficulty we had with the timing chain! ), then I had to leave early enough to pickup friends from the airport returning from a trip. 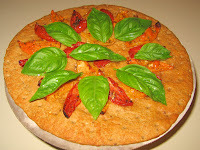 From Asheville, I had picked up an 8" round organic tomato-herb focaccia made from spelt flour made by Annie's Natural Bakery in the mountains, and I heated it for a few minutes on my pizza stone in a 300°F oven. I also grilled some red corn over my gas range's flame, stripped the kernels, and mixed in salt, fresh lemon juice, and Earth Balance margarine. Finally, I grilled an artisanal vegan apple-sage sausage by the Field Roast Grain Meat Company. Tonight we were fortunate enough to have one of my cousins from Connecticut and her close friend visiting. They are enroute to vacation for a few days in Myrtle Beach, SC, and are staying with us tonight. It's delightful seeing them! With the long Memorial Day weekend, they had bad traffic and didn't get here till after 12:30. I had dinner ready waiting for final preparation, and we ate at 1a or so. My stomach seems a little better, but still not great and I have low appetite, so I made a small plate for myself and avoided cooking with acidic foods like peppers and tomatoes. But I did have the main courses and a tomato-less salad. I made risotto much like I described back in March, but didn't use garlic and toned it down in flavor just a bit. It seems to have become a convention that I use a 6-ounce container of soy yogurt as my unit of measurement. I prepared about 3 1/2 units of vegetable broth by bringing water and 2 vegan bouillon cubes to a boil and then simmer. I sauteed, in a nonstick heavy pot, about a quarter Vidalia onion and a small shallot, both of which I had cubed fairly finely. After a minute or so, I added chopped shiitake mushroom (I also had dried porcinis, but needed to use up the shiitakes as well as a portabella, so went this non-traditional route). A minute or so later, I added a unit of arborio rice and stirred till the rice was mostly clear and not white, perhaps two minutes. Then I added a unit of white wine and stirred till the wine was absorbed, another minute or so. I continued for the next half hour or so adding a ladle or so full of the hot broth, stirring the mixture almost constantly, making sure never to have the rice swimming in liquid, but always moist. When the rice was done (i.e., all the broth used up), I added a little salt, freshly ground black pepper, vegan Parm! "parmesan cheese", maybe a teaspoon of fresh oregano, and at least a quarter cup, maybe a bit more, of artichoke hearts. 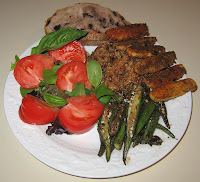 I also served some lemoned green beans and a salad with organic rose petals from my garden. I served a simple dinner tonight - just quinoa, leftover dhal from my Mom, and, for my wife, some bread with a red pepper spread (crackers for me). I miss cooking - and normal digestion! I was at a photography conference in the Blue Ridge Mountains of NC from Friday through Sunday and must have eaten something, probably Friday night, that bothered my stomach; it's been upset since Saturday. 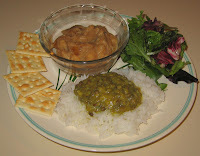 I ate out again on Saturday but then asked my Mom, who lives nearby, to make a simple meal with white rice and crackers, banana, and I think a little dhal (lentil soup) when I returned on Sunday night. My wife and I ate at my parents' home on Monday and had kicheri. My wife made very good mung dhal with peels intact for dinner yesterday along with white rice. My stomach seemed better, so I thought today I would try cooking something simple. Like I did back in March, I made my version of velouté (thickened soup). For about 8 1/2 hours in the slow cooker, I simply had cooking on low, halved small golden potatoes, about equal quantities of Living Harvest brand Hempmilk™ and of water, and sliced turnips. I used no leeks, onions, bell peppers, or anything strong or difficult to digest like barley, but did include a cube of vegan bouillon and a little rosemary from my garden, a little dill weed, a little salt and pink peppercorn, and some ginger (I put some raw shallot in my wife's serving). I thickened it just before serving by mixing in dehydrated potato flakes and Eat in the Raw's Parma! vegan "Parmesan cheese". It was certainly good, but didn't compare to how I had made it earlier. I served this with leftovers from yesterday and crackers, plus a little salad greens (I made hers more hearty with lots of large chunks of heirloom tomato). Alas, I don't think I was ready for more normalcy. Tomorrow I'm likely to ask my dear wife to return to the kitchen to make something simple. My wife took her relatives to Washington, D.C., and I was on my own today. I thought that I would make a strozzapreti pasta dish with vegan Field Roast "Grain Meat" Company's apple sage vegan sausage. Since she's not here, I feel free to duplicate something I've made earlier, but I ended up creating a new dish - which I hope to make again soon for her. I made a very simple pesto; now that I have basil growing, I had three teaspoons of frozen chopped basil that I thought I should use up. I put a tablespoon or two of oil in a small bowl, along with the basil, a little salt, and a little vegan Parm! "Parmesan cheese", and put it in my toaster oven on low heat for a few minutes, then mixed. 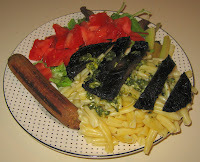 I boiled the pasta (it takes 7-8 minutes to be al dente) and served it, with a portobello mushroom that I had grilled on top and finally the fast pesto. Yummy! I had the privilege of having Madeleine and Will Tuttle over for dinner tonight. Will's talk was interesting and motivating on Saturday night, about the importance of veganism to help achieve world peace and harmony. They stayed on in town for talks and consultations, and tomorrow are recording a radio interview before they leave the following morning. I sauteed shallots, red onions, yellow onions, russet potatoes, bell pepper, Anaheim pepper, green beans, and tempeh, along with a little rosemary needles and soy sauce added near the end of cooking. I served it with a brown rice mixture. I think that they enjoyed the meal! I'm glad that I prepared the quick quinoa meal late on Monday night / Tuesday morning. It was a simple meal, but my wife's relatives - kids and all - seemed to really like it. I had planned a more elaborate meal for them last night, but we were enthusiastically sightseeing in the area and it ended up being 9p; we still wanted to drive through the Duke University campus and show them where we hold our annual Thanksgiving feast, so we ate out at Xiloa Nicaraguan restaurant. Though I was anxious to have them try risotto, which I was going to make, the restaurant outing made a lot of sense and we all enjoyed our meals at Xiloa (I had nacatamales, as I usually do). They are all of sightseeing in Washington, DC and then on to New York City. I was supposed to attend a photography meeting and had to attend to a repair on my wife's car, so had less than an hour to eat (it turned out that the meeting started earlier than usual so I didn't go). My wife simply heated leftover South Indian food from last Thursday (lemon rice, spicy sambar soup [not shown in the picture], uttapam "Indian pizza", and pakora) and, when I came home from the repair, I added some raw vegetables and a simple hummus-tomato-mung bean sprout sandwich. My wife has some relatives from India visiting California and they flew in to s ee us, but came to Charlotte, about 2 1/2 hours from here. By the time they got home, it was about quarter after two in the morning and they hadn't eaten, so I put together a quick meal for them. I sauteed some okra and orange bell pepper and, in the last half minute or so of cooking, added a little cumin. In parallel, I made some quinoa in vegan broth, along with turmeric, ginger powder, and smoke flavoring. I mixed the vegetables in, along with salt, home grown oregano, and paprika. I also pan roasted halved golden potatoes. I mixed in rosemary from my garden, salt, pepper, and a lemon marinade. Yesterday, we went to a graduation party at an Indian restaurant and had a reasonable dinner of rice, okra, and chickpeas. On Saturday, I made a rice dish with Brussels sprouts and tempeh; I'll have to try making this again. On Friday, our vegetarian society speaker, Will Tuttle, his wife, and my wife and I ate at a South Indian restaurant, Udipi; I enjoyed a nice rava dosa. We again had South Indian food, this time from Tower Restaurant. I have some Pluto's Caribbean Bliss seasoning that I occasionally experiment with; Caribbean jerk is an interesting spicy cuisine. I had the idea yesterday to grill some okra then coat with the jerk seasoning, which is what I did. I let the okra, cut in half longitudinally, saute for at least 7-8 minutes, till it had medium-dark browning. I then put it into a bowl and mixed in salt and salt-free Caribbean Bliss seasoning. I sauteed tempeh and did something similar, but with no salt. 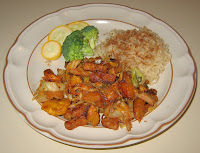 It was great, served with a brown rice mix - the spices are tasty and the heat is subtle but grows a bit over time. Today, incidentally, in the third class of cooking for children, we inspected the mung beans that we began sprouting in class on Monday, and they were ready with small sprouts! Students sampled the sprouts, mixed with lime juice and salt, and most liked them. We started some chickpeas soaking so that they will sprout (after half a day, they will be drained then rinsed and drained twice a day, just like the mung beans). We made fruit smoothies out of frozen organic fruit (cherry, mango, and blueberry, along with banana) and rice milk. Most enjoyed their drinks! I may not have much to post about in the coming days. Tomorrow I have a photography meeting and may have to meet my wife enroute from cooking class to eat out, but also may just cook late (or set up the slow cooker to have dinner mostly ready when I return). On Friday, I am delighted to be entertaining a speaker from California who will be presenting at a vegetarian society event on Saturday; I'll prepare for that potluck but not have a blog entry dinner plate. Sunday is Mother's Day and we're invited to a graduation dinner party. I enjoy a simple and so-tasty way of making pizza that I understand is closer to the original pizza - no sauce or cheese! What I do is overlap slices of roma tomatoes on a crust, put a little dried oregano and olive oil on top, and oven bake (400-450°F) for 8-10 minutes till the tomato melts into a sauce. No toppings then - just some fresh basil leaves! 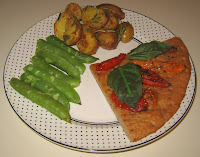 Today I used a new "Great Grains" organic Rustic Crust brand pizza shell and a twist on my simple recipe. I used red and golden roasted tomatoes, and didn't overlap them. 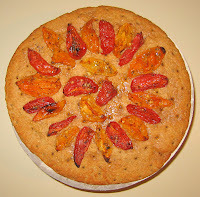 I baked at 450°F for about 8 minutes, topped with basil leaves fresh from my garden, and served (my wife and I finished it off, each enjoying two pieces). I also served English Peas and some delicious Yukon Gold Potatoes. I forgot how tasty these potatoes can be! I simply boiled them till they were just cooked, maybe 8-10 minutes. I halved the potatoes and mixed in Earth Balance margarine, fresh rosemary, dried dill weed, paprika, salt, and ground flaxseed (for the nutrition; I didn't notice much of its taste in the dish). By the way, today in classes 2 of 5 of my after-school teaching for about thirty 5-11 year-old children, I asked the children to think about what foods they might like to take when they hike. We made custom mixes of trail mix out of coconut, dried cranberries, walnuts, raisins, and dried bananas. We checked our mung bean sprouts - they are growing bigger and have some white exposed under the skins. Last June and May, I had come up with some nice baby artichoke dishes that I used to inspire tonight's dinner. For the first time ever, I had purchased parsnips, which, once peeled, I understand can be used like carrots. They taste very nice with a good sweetness. I tore away the leaves of each of the artichokes till I got to lighter colored and more tightly packed ones. Then I cut off the top third of each artichoke and the very bottom, and quartered the heart. I put these quarters, along with some chopped red onion, into a covered pan of simmering broth for about 17-19 minutes till the artichokes were soft, then added peeled and sliced parsnips for about 2 minutes (when I cut the artichokes and parsnips, I put the pieces in a bowl with lime juice to keep from discoloration) more of cooking. 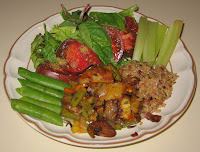 I prepared quinoa and served the artichokes and parsnips, along with the broth, on top of the quinoa. I also lightly grilled green beans then mixed in some fresh squeezed lime juice, salt, and pepper. Along with heirloom tomato chunks, I served some whole wheat walnut-raisin bread, great for breakfast, but with an elegant dinner face of tahini spread with a little bit of red onion. We enjoyed dinner! This week, by the way, I'm teaching several after-school cooking classes for children ages 5-11. Last Monday afternoon, I received an email asking if I could teach back-to-back sessions over one or two weeks, each session lasting around 1 and a quarter hours, for an arts program for children. I have some conflicts for next week, but am teaching this week. It's fun! I have a helper or two who can do chopping, boiling, baking, etc. In today's class, I had each student introduce another student and report on their interest in cooking and interest in vegetarianism (one of the kids said they like to eat ants!). I talked about sprouting, and we set some mung beans to sprout. We made cashew butter and fruit jam sandwiches on whole wheat bread, which everybody seemed to like. Today was a difficult day as I recently signed up for an infant bereavement photography organization, Now I Lay Me Down to Sleep and was called at 8a for my first contribution. The organization is for professional photographers who are willing to come, for no cost, to capture very sad times but provide memories that may be the only tangible keepsake of a baby. A family had a stillborn baby, their first child, late last night, and wanted photography. I surprised myself by, my kind wife accompanying me, being supportive and warm, but also doing the job well and not being overcome with emotion. But it did give me pause and put me in an odd mood. My host Korean student in the UNC International Friendship Program is leaving tomorrow for a month in Peru sightseeing right after her exams end, and a joint Singaporean friend is returning home soon, so we had planned to get together for dinner. 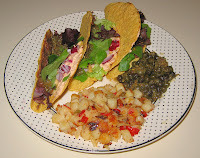 It took some energy to ramp up for it, but I put together a meal that all seemed to enjoy. I simply made a saute of various vegetables, including asparagus, onion, and mushroom, as well as tempeh and, added at the end, capers. I had purchased heirloom bruschetta topping, and served that with some sesame semolina toast. Today, I made a simple sauté of baby bok choy. I sauteed some red onions for a few minutes, then added red bell pepper; a minute or so later, I added bok choy leaves, cut in half the long way, and cooked just for another minute or two, also adding a bit of cumin seeds in the last half minute. 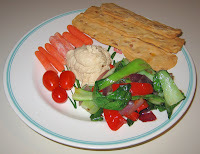 At the store today, I found some Spanish artisinal sunflower seed "saladito" crackers that looked good; I served them, along with some prepared hummus. Tonight was the last night of the 6-session 3-hour ethnic vegetarian cooking class that I teach. My students made food of Thai and Indonesian origin/influence. Their Indonesian Stew was very good and included a homemade curry paste, vegetables, and pasta (thin rice noodles, which we didn't have, could have been another option). Their Indonesian Tempeh and Vegetables was quite good with sauteed tempeh in (reduced fat, organic) coconut milk, and several people said that the tomato (with Ume plum vinegar) and/or cucumber salads were among the best dishes that we had made in class. We also had Thai Jasmine rice. For dessert, they made ground cashew - wheat germ - whole wheat - brown rice syrup - based round cookies with vegan chocolate chip cookies. The food was good and many of the students rated tonight as the best food of the class. It seems like a while since I've cooked! I'm one of two new co-presidents of the Brown University alumni association and on Friday night we had a party for area high school seniors who have been accepted. There were a number of vegan items that the host picked up from Whole Foods Market, including hummus, cactus "cakes" with avocado dressing, raw vegetables, and more. We were still hungry so stopped by at Verde in Durham, where we enjoyed some tasty lentil soup and baked eggplant. On Saturday, the vegetarian society had a potluck dinner with a speaker talking about Jainism (the world's oldest religion) and its relationship to vegetarianism. We had enough leftovers from the Brown party to bring with us. Yesterday, we went to a good classical Indian music concert (sponsored by ICMDS which I used to serve on the Board of some years ago; Ustad Shahid Parvez Khan on Sitar and Shashank Subramanyam on Bamboo Flute were accompanied by Ramdas Palsule on Tabla and Parupalli Phalgun on Mridangam - flute and sitar made for an interesting combination that was quite pleasing!) and were both hungry so decided to eat out. We went to Panzanella Restaurant and were lucky to find that they had vegan pesto, used in their one vegan pasta dish, so ordered two (personal sized) vegan pesto pizzas, one with olives, tomatoes, and artichoke hearts, and the other with grilled eggplant and roasted garlic. So good!! We have now had two excellent pizza experiences in a row here and we both think this is probably the best pizza to be had in the area. We'll be back! Today I steamed baby artichokes for about 20 minutes till tender, after removing a few tough outer leaves, cutting a bit off the stem, and cutting the top 10% or so off. I made a dipping sauce with melted Earth Balance vegan margarine, salt, pepper, fresh herbs (basil, oregano, and rosemary) from my garden, and some thinly sliced onion. We have enjoyed seeing cardone growing in gardens - it looks like a giant thistle or artichoke, and has a big, pretty flower. It turns out that the stalks are edible after soaking in salt water for 3 hours (which I did) or overnight, after being cut into 1" or so pieces. I measured out water in a 3 to 1 ratio (normally 2 to 1 is used) to heirloom red quinoa. I put the water, rinsed cardone, and vegan bouillon cube into a pan and brought it to a boil. After 5 minutes or so, I added the quinoa and cooked for another 7-10 minutes or so, till the tell-tale spiral of the quinoa demonstrated its doneness. 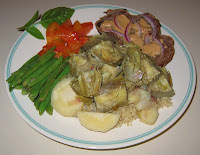 It tasted okay - a cross between celery and artichoke - and I'll try it again, maybe breaded then sauteed. I also served some fresh sour dough toast with roasted golden tomatoes.